Obviously our photos are important to us or we wouldn’t be scrapbookers. If you have an organized and established routine, the more likely you are to transform your photos into precious layouts and other projects. In this article, I’d like to share my personal system for digital photo organization. 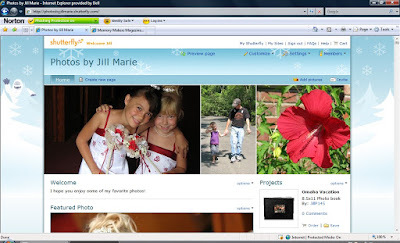 You'll notice that I reference Picasa and Shutterfly, which happen to be the programs/services that I prefer to use. I do also sometimes use Photoshop Elements when I want to do more advanced editing. There are many others to choose from, but these basic steps are generally very similar regardless of which programs/services you use. Before you upload any more pictures, creating a folder system is key. Personally, I tend to think in chronological order, so I have a folder for each year in my photos folder on my computer. Within that folder, I have subfolders for each group of photos that I take. For example, the folder containing the pictures from my daughter’s birthday party this year would be titled ‘2008_06_09 – Kaitlin’s Birthday Party’. ALWAYS put your dates first and use the year_month_day format. That way your computer will always be able to automatically put them in chronological order for you. This step will probably take some time, but you will thank yourself later. Trust me. 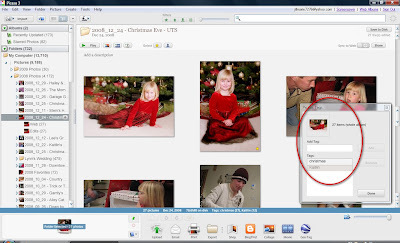 Once you have your folder system set up, simply be sure to upload your pictures to the correct folder, name appropriately and you’ll never have a jumbled mess of pictures to sort out again! This is a tough one for a lot of people, but it is necessary. Why keep 124 photos from an event if you know that only 20 of them are necessary to preserve your memories. I often take my daughter out for a shoot and only keep a dozen or less out of 50 or more shots. The first ones to go aren’t so hard…the blurry, the cut-off head, the finger in the viewfinder…but it does get a little harder. You have to look at your photos objectively and use a critical eye to chose the best. However, I do have to put a bit of a disclaimer here. There may be some situations where none of your photos are particularly good. This happens to me sometimes when there are lighting issues beyond my control. There are times when ‘bad’ photos are better than no photos, so while you need to purge, don’t purge so quickly that you delete every photo that you have of an event you wish to have a record of. Tagging (or adding keywords) is an important step. It is especially helpful if you want to find a collection of photos that would come from multiple folders to create a theme albums or layout spanning a period of time. Tags don’t have to be complicated. I commonly tag my photos with the name of each person in them. Other common tags include events, holidays, seasons, activities, locations, etc., but you can obviously use whatever tags you think will be useful to you. Then, if I want to create a mini-album of my daughter’s Halloween costumes over the years, I simply do a search for Kaitlin and Halloween and I come up with a group of photos with those two tags. This is MUCH easier than trying to sort through years of folders. My editing workflow is an article in itself (stay tuned...), but as you all know, even the best out-of-camera shots can be improved with a little editing such as increasing the contrast, cropping for better composition, warming up skin tones, converting to black and white, etc. a) I select all the edited pics in the folder and then export FULL-SIZE versions into a subfolder of the original folder called ‘Edits’. To achieve this, I choose 'Use Original Size' under 'Image Size Options' and 'Automatic' under 'Image Quality'. b) I select all the edited pics in the folder and then export WEB-SIZED versions into a subfolder of the original folder called ‘Web’. To achieve this, I choose 'Resize To:' (I do 480 pixels) under 'Image Size Options' and 'Normal' under 'Image Quality'. I also like to add the watermark option for photos which may end up on the web. By exporting the photos, I preserve the original photos and have a set ready for upload to my favorite photo printing site and another ready for web use, either on my blog or in online galleries. Rating is another important step. 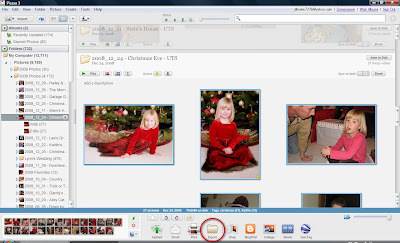 In Picasa, a system is used where you can ‘star’ favorites. So, even if I take 50 photos in a shoot and keep 10, there are probably still only 1-3 that are what I like to call my stand-outs – the ones that really speak to me or capture the spirit of my subject or event. Once I have my Edits folder, I then star those 1-3 photos. What good is this, you might ask. Well, at the end of each year I often create photo books and other gifts for family members highlighting my daughter’s or my family’s year. All I do is then is select my starred photos folder and all the BEST pictures from the year are all in one place and ready to be made into compilation CD’s and other gifts! Now it’s time to upload to your favorite online photo printing service. Personally, I prefer Shutterfly and I can upload the photos from my Edits folder directly from their software. Simple! I do sometimes wait until I have a large batch of photos before ordering (or until I get a free shipping email from Shutterfly). Isn’t one of the best parts of taking all these photos is sharing them. These days, you can easily do so even before you have the prints in hand. You can upload your now exported web-sized versions to your blog or favorite online gallery. You can also create your own photo sharing website through many online photo printing service without further uploading. Shutterfly offers new share sites that have some amazing capabilities! No digital photo organization article would be complete without a reminder to backup. We’ve all heard the horror stories of months or years of lost photos and the devastation that affords for their owners. Don’t let it happen to you! If you upload to an online photo printing site like Shutterfly, your photos are already somewhat protected, but retrieval of your full-sized images can sometimes be somewhat limited or expensive if you lose your copies. So, developing your own CD or DVD backup plan is still important. So that’s digital photo organization in 8 steps! Although I personally use Picasa (a free software offered by Google) for the processes above, most photo software out there has similar capabilities. I hope that you’ll take this information to gain a whole new level of photo organization in 2009! Come put all your pictures into our photo books now. Undecided? Then come take a look at these photo book samples here. Making custom photo books with us is very easy.